Multi-antenna transmission is the transmission (or reception) with multiple antennas at the same time at the same frequency. The first end, improving link quality, can be achieved with spatial diversity. This means that the same signal is sent and/or received at the same time with the same frequency with multiple antennas. The increase in link quality is facilitated by the slightly different spatial locations of the individual antennas. This results in different channel conditions between any pair of transmit and receive antennas, which can be exploited to recover a better signal at the receiver end. The second end, increasing link data rate, can be achieved with spatial multiplexing. This means that different signals are sent at the same time with the same frequency with multiple antennas. 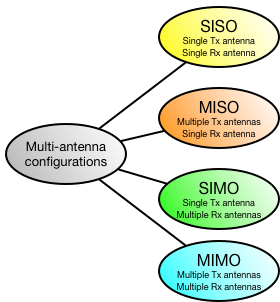 This requires that the receiver also has multiple antennas, in order to receive all of the individual signals (thus, all spatial multiplexing schemes use the MIMO antenna configuration). This requires the different signals to be sent in a certain manner that allows the receiver to reconstruct the individual signals from the received supersposition of all signals. Multiple antennas at transmitter and/or receiver.